High ketones are a sign of inefficient fat burning. If you have high ketone readings or if you can easily produce high ketone readings, you are not 100% fat adapted. Of course, if you are on a Zero Carb diet, you are in ketosis all the time, but our ketone levels become stable, just like our blood sugar levels. The science on this is very new and very misunderstood. Dr Phinney has done the most research on it, but even he is misunderstanding. 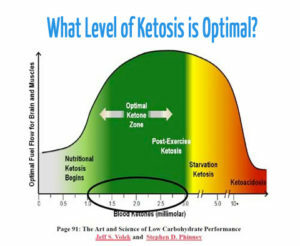 He thinks elevated ketones, in a target range, are a great thing and we should strive to be in “nutritional ketosis”. I wish he would try Zero Carb, so he can see what happens when people eat the human optimal diet, meat, with no restrictions or counting macros. I am still experimenting with this and have not had the time to totally punish my body to see how high of a reading I can get, but I did manage to get a ketone reading up to 1.5. 1.5, according to Dr. Phinney, is the minimum level to be in “nutritional ketosis”. Seriously?! For me to get a ketone reading up to 1.5, I lowered my food intake for a few days prior to the day I skipped breakfast. The day I skipped breakfast I worked out doing various strenuous things (steep hike and several hours of stacking wood, until I could not pick up another piece of wood). I was physically exhausted, I then tested ketones expecting to see at least a 2, after not eating proper amounts of food for 2 days then fasting for 24 hours, and all that exercise and it was only 1.5! There is no way I could live like that every day. Nobody knows what keeping ketones artificially high for extended periods of time is going to do to us. It is impossible to naturally maintain high ketone levels. You have to constantly manipulate your food intake to maintain high levels. Who wants to live like that? It seems our bodies learn / adapt to only produce the amount of ketones that are needed. If you are constantly manipulating your fuel/metabolism your body is confused and isn’t functioning at it’s best. I believe if I decided to start training for a marathon, my ketone level would go higher for a while until I adapt to this new activity level, then my ketone readings would drop back down to 0.8 as my body becomes more efficient at operating at this higher activity level. My body would be using more ketones (fuel) on a daily basis, due to increased activity, but not producing so much that they are being wasted, causing high ketone levels. Our bodies are very good at being efficient. My theory is, that, this is why the KETO dieters often complain of no energy, especially the athletes. Your body wants to run on either carbs, or fat, not both. People who try to straddle both fuel sources never find optimal performance. Just eat meat, freely, the way we were intended and stop worrying about maintaining a number on a meter! To learn more about the Zero Carb, Carnivore diet, please join us in our Facebook Group. Next Article Zero Carb Carnivore Diet and Cheating. I’ve been in ketosis for a long time, and recently began doing the blood ketone measuring; I rarely go above .7 and .5 is more common. I am in my sixties, moderately active, and eat almost nothing but a varied protein diet, a couple meals a day. I’ve mostly used a breathalyzer, which again rarely shows more than a moderate reading. I conclude my body is burning a clean blue flame. Right, but “Optimal Nutritional Ketosis” starts at 1.5. My understanding is that the “nutritional ketosis” threshold reading is generally agreed to be point five (.5), not 1.5 as stated above. I’ve been very low carb for four years- and nearly zero carb for the past year; I’m an active 50 year old female, and my ketone readings are very similar to yours. You’re lack of ketones is probably because you are probably eating too much protein, which converts to glucose in the absence of carbs and this blocks ketone production. Just a thought.